On March 12th, the US Department of Transportation’s National Highway Traffic Safety Administration (NHTSA) announced that they will be releasing a series of advertisements directed at parents of children years 8-14. Although children this young are not yet getting behind the wheel, NHTSA believes it is important to remind parents that these children must be buckled up on the road. 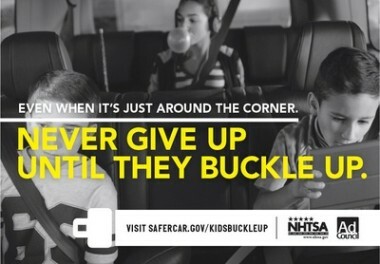 Making sure children from 8-14 are consistently wearing seat belts correctly at all times provides the main concern for this ad campaign from NHTSA. A recent study from the NHTSA found that the parents sometimes neglect their children’s seat belt usage during the craze of the day, especially when driving back and forth rapidly between engagements. Seat belt save lives and it takes only one freak moment for a car accident to change a life forever. In addition, the conducted study shows that as kids age they become less likely to buckle up, especially when they start to become young teens. Unfortunately, 1,522 children between the ages of 8 and 14 have died from injuries sustain during a car accident over the last 5 years, and more than half of them were not wearing a seat belt. This does not take seat position into account. It is natural for children to test the limits as they grow older. Yet, wearing a seat belt should never be something one takes a gamble on. It is important to get into the habit of wearing a seat belt at all times, no matter the length of the trip. Once done time and again, it will only be second nature to wait for the seat belts to be strapped before taking off.